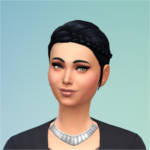 Because I haven’t gotten enough of having lots and lots of babies, now I am going to start a 100 baby challenge. Good job on the yard sale! I tried selling at the Flea Market with Robin once. She couldn't retrieve her items, so she had to leave all of her flower arranging items behind and never went back. Jenn wrote: I love her so much. She is so much fun to play. Yeah, I made the mistake of doing it at the flea market in my legacy and had the same thing happen. That was when I discovered doing it at home as a yard sale is much better and you remain in control of the inventory. Baby #1 is born - should be a toddler before I post the next update, tonight since it is not quite 5pm. I am trying to decide on spacing of the kids since she is a single mom. I think I will try having her get pregnant when the youngest becomes a toddler and see how that spaces out. I loved the first chapter! And Merry is very beautiful. I didn't know you could sell things like that from your home lot. That's great! I'll have to try that sometime. One more update, and I am headed for bed. With school this week, it will probably be later in the week before I have another one. Out of curiosity, what lot traits are you using? I am using Private Dwelling, Good Schools, and Child's Play. I figure it is all about toddler skills and grades, and preventing vampire attacks. And I dont know how long spacing will work. Merry doesn't have Fertile yet, but she will probably get it soon. Good Schools is a life saver! I didn't know about that one until over half-way though my first Matriarch's reign lol! Looks like you've made great choices for lot traits. Oh goodness! Denali is ADORABLE! It feels like Tahiti is progressing so quickly, I have to keep reminding myself there are going to be 100 kids - she is just the first. LOL And good schools is definitely helping. Poor Tahiti! Not good for the first day of high school! I love the new house! Especially the "outdoor" area in the middle! Catalina is adorable! Are you going to cure her of vampirism before she leaves the house? This is so good! I love how cute the kids have been so far, and I really like the naming theme. Avenie wrote: This is so good! I love how cute the kids have been so far, and I really like the naming theme. Thanks - normally I stress over the naming scheme - planning it out in advance, but this one was a spur of the moment and I am having fun coming up with names to use. Ha! Told you the spacing wasn't going to work lol!